If you want to experience a lifetime photography tour, Ladakh is the answer. 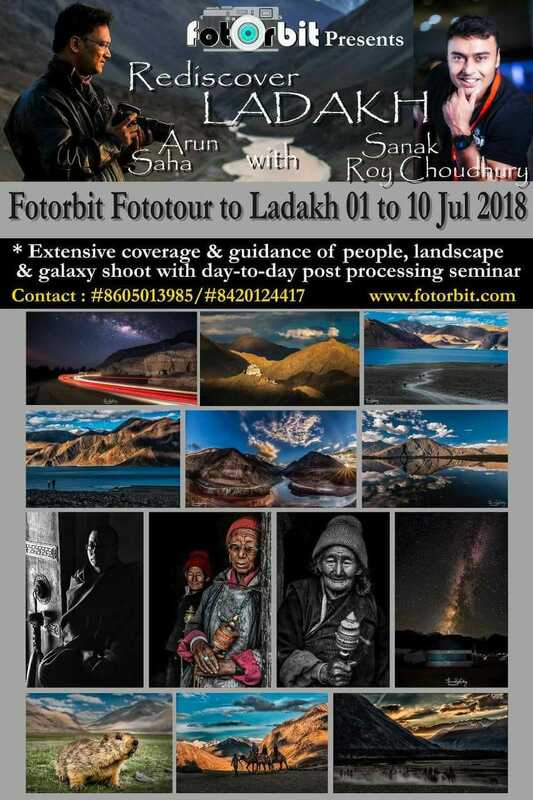 The breath-taking landscapes, beautiful lakes, adventurous high-passes, spectacular monasteries with wonderful people makeLadakhmore than a perfect place to photo-tour…andLadakhfototour with FOTORBITmakes you to achieve your dream with utmost satisfaction.Our trip itinerary covers the most photogenic places of Ladhak guided by experienced mentors and technical experts of the field. 1st July, 2018 : Arrival at Leh by afternoon and report at pre-booked hotel. Spend a relaxed day in thehotel for acclimatization. First day is very important for acclimatization. Evening visit to Shanti stupa and nearby Leh market. Today our mentors will arrange your inner line permits for Ladakh. Overnight stay at Leh. 2nd July, 2018: After breakfast drive to Lamayuru enroute visit Liker Monastery, Magnetic hill and Sangam. Post lunch drive to visit the mesmerizing Moon landscapes and the Lamayuru monastery. Overnight stay at Leh. 3rd July, 2018: Early morning drive to Nubra Valley via Khardungla pass (Highest motorable road in the World, 18,380 ft).Post lunch, enjoy the camel safari at Sand Dunes between Deskit andHundur Village on d back drop of serene Deskit monastery. Overnight stay at Hunder. 4th July, 2018 :Early morning driveto Turtuk. Visit picturesque Turtuk village, Indo-Pak border, Shyok river, covering differently beauty of the village people and their lives. Overnight stay at Hunder. 5th July, 2018 : After Breakfast, begin your journey for the daywith the visit of Deskit Monastery n then enroutePangong Lake viaKhardungla. The sunset is the perfect backdrop you can wish for. Enjoy the beauty of the lake on the bank of Pangong while appreciating the changing colors and fascinating high altitude of the Lake. Enjoy the evening photo shoot at Pangong lake. Today at night we will try milkyway shoot (subject to clear sky) under expert guidance. Overnight stay at Pangong in Hotel. 6th July, 2018 :Wake up early in the morning to witness the mesmerizing beauty of Pangong Lake under the fresh morning rays. Post breakfast set off for a drive back Leh. By late afternoon arrived in Leh. On evening free time for market or take rest. Overnight stay at Leh. 7th July, 2018 : Take a drive post breakfast, to pay a visit to the Shey Palace,Hemis Monastery, Thiksey and Sindhu Ghat. In the evening return back to Leh. Enjoy a comfortable overnight stay at Leh. 8th July, 2018 : Today early morning drive to Tsomoriri Lake . Tsomoriri Lake is about 220 kilometers from Leh and is located in an altitude of 4200 meter. The lake is famous worldwide for its picturesque beauty. While proceeding towards Tsomoriri Lake, visit the Chumathang Hot Springs and cross the Mahe Bridge. Evening take a walk around the Lake to enjoy the scenic beauty. Overnight stay at Korzok. 9th July, 2018 : After breakfast leave to Leh passing Puga (Sulphur Mine), Tsokar Lake, Taklang La Pass 17,585ft, 2nd Highest motorable road in the world. Arrival at Leh by evening. Overnight stay at Leh. 10th July, 2018 : Early morning transfer to Leh airport to board flight back to destination. Your memorable journey with FOTORBIT to land of dragon concludes here. Cost& Terms:Rs. 35,000/- per pax. Greater than 120 days from the start date of the Workshop: full refund minus service tax. I’m interested in this photo tour. Please drop ur contact no. or call me in 8605013985. We r just left with one seat. Plz call me up in #8605013985..